Scott’s sister, Stefanie Vallery, was killed in the attack. Hiroshi Toyoda (Japan), Evgeniya Artamonova Estes (Russia), Bas van de Goor (Netherlands), Gilberto “Giba” Godoy Filho (Brazil) and Hugh McCutcheon (New Zealand) were recognized in the 33rd annual enshrinement ceremony of the International Volleyball Hall of Fame. Pat and Sharkie Zartman, long-time residents in the South Bay area, and Ann Davenport, the long-time Regional Commissioner for the Southern California Volleyball Association (SCVA), have been selected as the 2019 Southern California Indoor Volleyball Hall of Fame (SCIVBHOF) Lifetime Service Award winners. Italy stayed perfect on the World Championships with its 10th straight victory to eliminate Japan from contention on Monday. The Italians boasted a 2-1 lead in the match and held on for the 15-13 tiebreak win behind 36 points by Paola Egonu. With a sold-out crowd looking on, Italy crushed the hopes of the home team, issuing Japan a five-set loss. 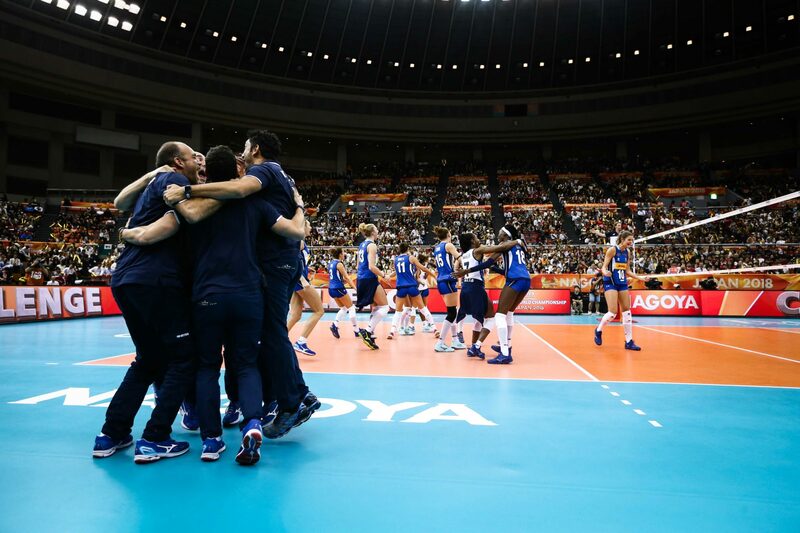 Italy piled up 13 blocks (to 4) and outdid Japan 74-65 in kills to overcome 29 miscues in the match. The Japanese were better from the service line, outdoing the Italians 6-2 in aces. 19-year old Paola Egonu notched a match-high 36 points with 34 kills and two blocks. Miryam Sylla (19), Anna Danesi (13) and Cristina Chirichella (11) followed. Sylla downed 16 kills and added two blocks and an ace. Danesi added eight putaways and a team-best five blocks, while Chirichella chimed in with nine putaways and two stuffs. Four Japanese played scored in double digits with Erika Arika leading the way with 17 (14 kills, 2 blocks, 1 ace). Sarina Koga (16), Risa Shinnabe (15) and Yuki Ishii (15) were right behind. Koga turned in a team-leading 15 kills, while Shinnabe added 13 and two aces. Ishii served up a team-best three aces to go with 12 putaways. In the tiebreak, Japan boasted an 8-6 lead at the changeover. Italy scored three in a row to tie it up at 9, then grabbed the lead on a block by Danesi. After another tie at 11, a stuff gave the Italians a 13-11 edge en route to the 15-13 win. The Italians led by as many as six in Set 1 at 23-17 before clinching the win at 25-20 on a Lucia Bosetti kill. Japan jumped ahead 7-3 in Set 3 and pushed ahead by five at 16-11 behind offensive efforts by Koga and Shinnabe. Egonu sprung into action pulling Italy within one at 16-15, but three Italian miscues and kills by Koga and Okumura claimed the win for the Japanese at 25-22. Italy bounced back to take an 8-6 lead in Set 3 and boosted its advantage to four at 16-12 and 22-18 behind Egonu putaways. Koga stopped the first Italian set point try to make it 24-21, but Sylla claimed the win at 25-21. Japan went up 6-4 in Set 4 and boasted a six-point edge at 16-10. Italian miscues and strong Japanese serving put the home side up 24-18 before Shinnabe sent the match to tie break.